NORFOLK, Va. – The SpartanNash Foundation recently donated $90,000 to Honor and Remember, a national nonprofit dedicated to honoring and remembering all those who paid the ultimate sacrifice in service to our country. The $90,000 grant is the result of SpartanNash’s scan campaign to support our military heroes and fallen warriors. From June 22 to July 4, each of the more than 160 SpartanNash-owned retail stores and fuel centers in nine states invited customers to join the Foundation in supporting Honor in Remember by donating $1, $5 or $10. Altogether, $182,000 was raised, and the dollars are now being granted to SpartanNash’s national partner, Honor and Remember, and three regional partners – Fisher House Foundation, the Disabled Veterans National Foundation and the Blue Star Mothers of America, Inc.
On July 19, the SpartanNash Foundation donated $90,000 to Honor and Remember. Holding the check from left to right: Ed Brunot, SpartanNash EVP, MDV president and Honor and Remember board member; George Lutz, founder of Honor and Remember; and board members Patricia Lutz and Mark Fulton. They are joined by MDV’s Honor and Remember volunteers. 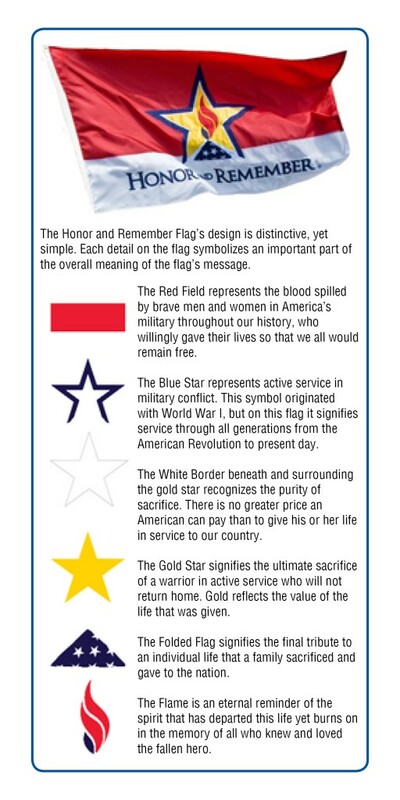 Founded by George Lutz after losing his son in Iraq in 2005, Honor and Remember’s mission is to create, establish and promote a nationally recognized flag that would fly continuously as a visible reminder to all Americans of the lives lost in defense of our national freedoms (see graphic to the right for flag symbolism). To date, 21 states have adopted the Honor and Remember flag as a symbol of remembrance. The organization also personalizes the Honor and Remember flag with the fallen soldier’s name and presents the flag to immediate family members. Ed Brunot, SpartanNash EVP and president of MDV, serves on the board of directors of Honor and Remember. SpartanNash retail stores fly the Honor and Remember flag at their corporate-owned stores and display the flag artwork on their fleet of tractor trailers, which travel 53 million miles a year.